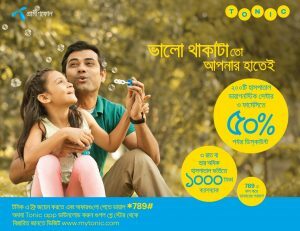 January saw the culmination of a 30-day nationwide ATL marketing campaign that successfully introduced Tonic to mass market consumers and cemented Grameenphone as a leader in the digital health space. Leveraging television, radio, press, and digital channels to reach an estimated audience of 110 million people, the campaign created consumer “pull” to complement a retail enrolment push across GP Centers, GP Express retailers, and recharge vendors. The marketing effort highlighted a major upgrade in benefits, with Tonic Cash coverage doubling (from BDT 500 at launch) and Tonic Discounts partners increasing from 75 to more than 200.